Joe’s has been serving up the coldest Schooners of beer in town since 1934! Not much has changed since then accept our selection, which includes your favorite staples like Bud, Coors, Busch, & Shiner along with a rotating selection of other beers. Not to be outshined, our famous Root Beer is also a staple at Joe’s and can really hit the spot on a nice hot day. Did you know that during the Prohibition Era, Joe’s stayed open and sold draft Root Beer to keep his customers thirst quenched? 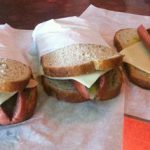 Legendary in name and taste, the “Joe’s Special” is a must-have and consists of a Polish Sausage made from our family’s own blend of spices, slice of Swiss cheese and pickle, mustard on rye bread. You can also get it with generous slice of our salami, a tasty blend of hickory smoked USDA beef and pork with delicate spices. Other classic variations include “taco” style (one slice of bread instead of 2) as well as with liverwurst, egg salad, or just plain cheese. Of course, if you are just looking for a good old fashion hot dog, we have those ready to go too! Marmion’s Peanuts are Grade AA jumbo fancy Virginia peanuts, a tradition that dates back nearly a century. Pick them up in 1/2 pound, one pound, and two pound bags. You can even read a little about how famous these peanuts really where in this article on “Over 100 Years of Peanuts“.